Being in my late 20s, it is hard to imagine going through something as frightening and traumatic as a cancer diagnosis. Unfortunately, I already know two girls my age who developed breast cancer — one is no longer with us. The uncertainty of cancer is unnerving, which has so many of us wonder how to actively prevent the ugly “c-word” from forming. Considering around one in eight American women will develop invasive breast cancer in her lifetime, prevention is more important than ever. This year alone, more than 266,100 new cases are expected to be diagnosed in the United States. If you are scared that you will one day be included in these stats, know that there are ways to actively reduce your risk. Like so many aspects of human health, researchers are still not exactly sure why one woman develops breast cancer while another woman doesn’t. Although those diagnosed will most likely never be able to pinpoint an exact cause, one thing is certain — DNA damage is the culprit. Once the DNA in a healthy cell becomes damaged, that cell can then mutate. Being a complex disease, there are both non-modifiable risk factors and modifiable risk factors. Non-modifiable: These factors are based on your genetics. There are two known genes that help protect us against breast and ovarian cancer, including BRCA1 and BRCA2. When these genes undergo a harmful mutation, damaged DNA does not repair as it should. These mutations can be inherited, increasing a woman’s average risk. Modifiable: These are based on environment and lifestyle factors. For example, your diet, level of physical activity, exposure to chemicals and the amount of alcohol you drink may all play a role. That is why you should actively address the variables you can change while being mindful of those you cannot. For centuries, plants and herbs have been used to combat a wide range of ailments, including cancer. Today, we’re aware that certain foods offer anti-tumor and immune stimulating properties. This has led to a movement where the public is interested in possible herbal remedies over synthetic medicines. The following six ingredients have been shown to actively protect against cancer, specifically breast cancer. Ah, my favorite. I am known to eat raw garlic on the regular. This potent bulb has long been used to combat illness based on its complex metabolite profile. One key compound known as ajoene is believed to delay cancer production. There are also a number of compounds that yield antioxidant effects. The available research has shown that garlic increases the number of suppressor T cells, converting lymphocytes into a form that is toxic to cancerous cells. Not only has garlic been shown to useful against breast cancer, but also colon, bladder, lung and stomach cancer. This aromatic plant is known to be an immune-stimulant. When I used to get sick, my mom gave me an Echinacea tea — something that I still drink to this day. While studying mice, it has also been found that one of the three Echinacea species (Echinacea purpurea) may act as a potential anti-cancer therapy by increasing the number of natural killer cells. This vibrant powder is no stranger to the health community. The active ingredient in this herb is curcumin, which is known to yield anticancer activity. Researchers have reported that the propagation of skin, stomach, breast and lung cancer may be limited by turmeric. Burdock root has therapeutic uses, offering potent herbal remedies. In the past, it was often used to help treat conditions such as measles and arthritis. However, it is now being explored based on its antitumor properties. When treating a breast tumor, ovary, bladder and pancreatic cells, burdock may lessen the associated pain and tumor size. 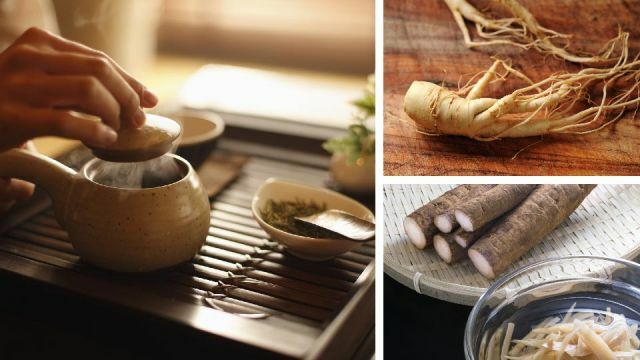 Mainly grown in Japan, China, Russia and Korea, the root of the ginseng plant is dried and then used for many therapeutic purposes, including cancer treatment. Ginseng has been shown to restart natural killer cells which are impaired during chemotherapy while enhancing the effect of macrophages and antibodies. Ginseng extract and its dried powder are believed to be the most beneficial. Offering the body polyphenolic compounds, green tea is high in EGCG. This polyphenol helps protect against DNA damage based on its antioxidant activity. In one review, it was stated that both in vivo (taking place in a living organism) and in vitro (taking place in a test tube or culture dish) studies have shown green tea’s anti-cancer effects. The key to preventing breast or any other form of cancer is to practice a clean, active lifestyle. Although there are variables that are not within your control, there are ways to potentially intervene. That is why you should always change what you can and better manage what you can’t. Actively care for your body today, and it will take care of you tomorrow (and beyond). Hey Buddy!, I found this information for you: "Scared Of Getting Breast Cancer? Here Are 6 Ingredients Proven To Kill Breast Cancer Cells". Here is the website link: https://www.thealternativedaily.com/scared-of-getting-breast-cancer-here-are-6-ingredients-proven-to-kill-breast-cancer-cells/. Thank you.